What Are The U.S. Drug Paraphernalia Laws? While it remains federally illegal to possess, sell or use weed or paraphernalia anywhere in the United States, many state-level laws differ about the legalities of recreational or medical marijuana use and paraphernalia. The U.S. drug paraphernalia laws can be very confusing to understand, but important to know if traveling with or purchasing paraphernalia. 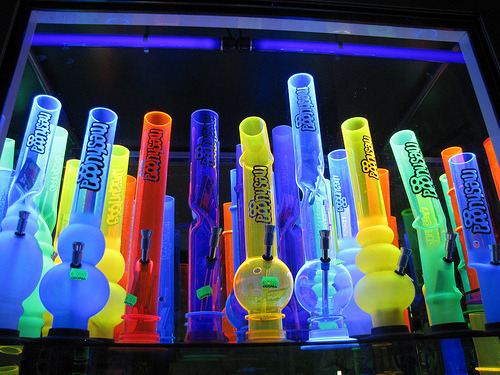 The term “For Tobacco Use Only,” is popping up all over the country in window fronts where paraphernalia is sold; “bong” is being replaced with the term “water pipe.” Shop owners make it clear to customers, and the government, they are not selling items to aid in the use or consumption of marijuana, which is still considered an illegal substances in many places. Rather, these items are marketed for use with pipe tobacco or hookah products, both substances which are completely legal anywhere in the USA. The trick with this loophole is it only works with clean pieces of paraphernalia, and even then it can still be left up to interpretation, depending on how strict the area you’re in is. Neither the buyer nor seller can reference the items in relation to weed or for use with weed, a mistake many buyers make before being asked to leave a store. Consider where you are. If you’re in California or Colorado, somewhere famously known for their legalization laws, the chances of getting into any serious trouble are probably slim. On the reverse side, being somewhere known for their anti-marijuana legislation, like Utah or Alabama, could have much more serious consequences for people caught with paraphernalia. While traveling, it would be best to keep any paraphernalia items squeaky clean. This way, if you are caught with something, there is less of a chance of being charged with anything criminally; you, too, can say it is for tobacco use only. Flying with marijuana or paraphernalia is never advisable. While airports do not screen for weed or paraphernalia specifically, police K-9 units are stationed throughout many areas, and in most cases can and will detect marijuana. Most states consider possession of paraphernalia to be a misdemeanor, but routine offenders or extreme situations can lead to more serious charges or even jail time. In many cases, the severity of the charges will be determined by whichever law enforcement officer catches you with the illegal item. So always, always play it cool, calm, and smart. The best way to protect yourself, whether traveling or at home, is to keep items clean and stashed away when not in use. Always be aware of the specific state laws for your location before traveling with or purchasing paraphernalia. What are your local paraphernalia laws and how do you safely travel with your items? Let us know on social media or leave a comment in the section below.